Rep. John Lewis, D-Ga., leads lawmakers down the steps of the Capitol to greet a crowd assembled after House Democrats ended their 26-hour-long sit-in protest on Thursday. 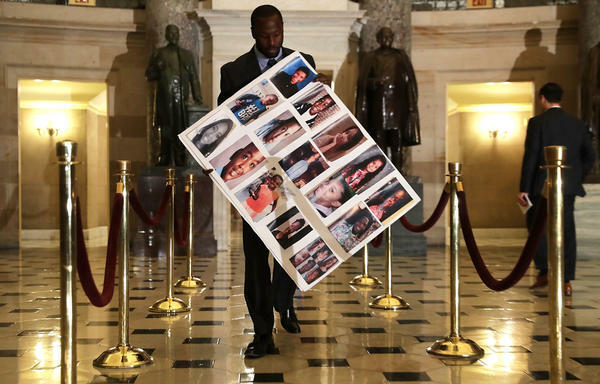 Charles Bolden, staff assistant of Rep. Robin Kelly, D-Ill., holds a poster with pictures of gun violence victims from Chicago as he walks toward the House Chamber on Wednesday in Washington, D.C.
Outside the U.S. Capitol on Thursday, a supporter watches the proceedings being live-streamed from the House floor by Democrats taking part in a sit-in. 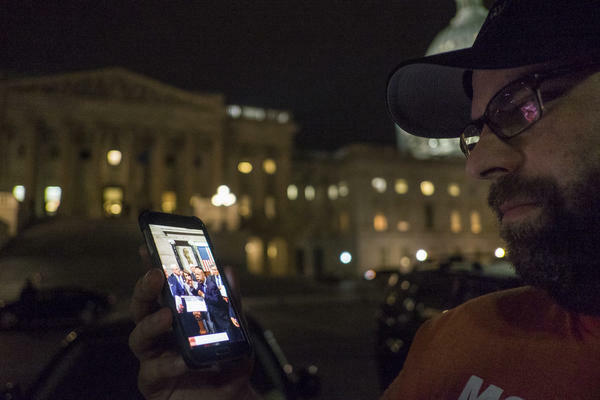 Supporters of House Democrats taking part in a sit-in in the House Chamber shout encouragement from outside the U.S. Capitol on Wednesday night. House Democrats have ended their almost 26-hour-long sit-in to push for gun control legislation, pledging on Thursday afternoon to continue their fight once Congress returns from the July Fourth recess. 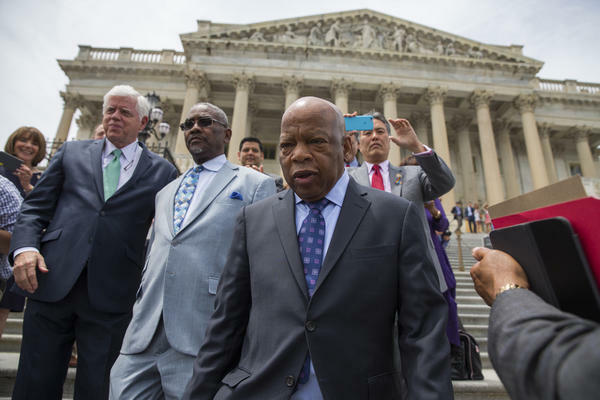 Rep. John Lewis, D-Ga., ended the daylong protest surrounded by his Democratic colleagues. The civil rights leader proclaimed that this "is a struggle, but we're going to win this struggle." He pledged to come back on July 5 after the congressional recess "more determined than ever before" to push for reforms in the wake of yet another mass shooting last week at an Orlando gay nightclub. After they vacated the floor, Lewis and other Democratic leaders headed outside the Capitol to address supporters of their sit-in who had gathered throughout the push. 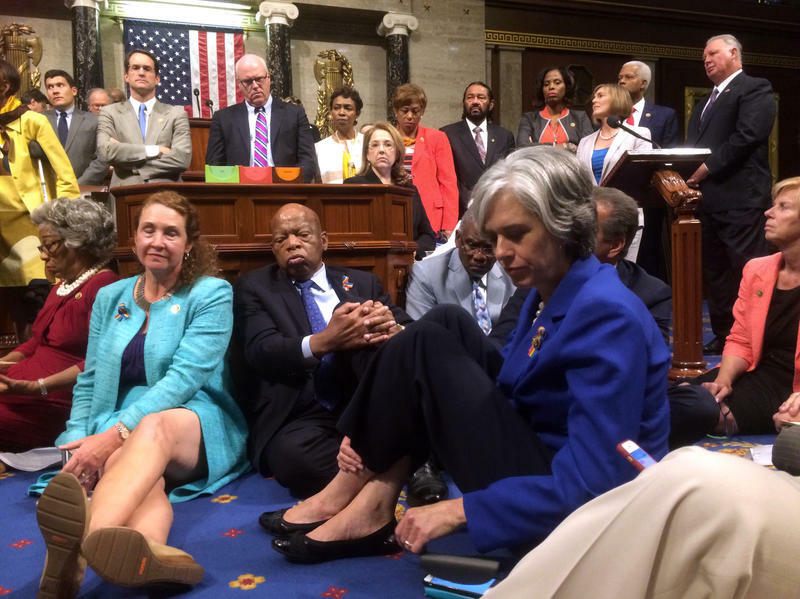 The sit-in began before noon on Wednesday, when House Democrats took to the floor. Chanting "No Bill, No Break" and waving posters with the names of victims of gun violence, the Democrats vowed to allow no House business to happen until there were votes on two gun control measures. Speaker Paul Ryan, R-Wis., remained resolute on Thursday morning against their calls, hours after he adjourned the House for the July Fourth recess after passing a Zika funding bill in the middle of the night. "We are not going to allow stunts like this to stop us from carrying out the people's business," Ryan said at his weekly news conference. He argued that if Democrats wanted to bring the legislation to the floor, they could try through a discharge position but that any bill has no chance of passage in the Senate. Ryan held up emails from Democrats fundraising off their sit-in and said Democrats were simply "trying to get on TV." "I'm really not sure what their plan and endgame is here," Ryan said, adding that he worried about the precedent it's setting. "When we see our democracy descend in this way, it's not a good sign," he added. C-SPAN had relied on live video streaming on Periscope and Facebook to cover the sit-in. Texas Rep. Beto O'Rourke was among those streaming the events. There was a flurry of activity beginning late Wednesday and continuing into the wee hours Thursday, when Ryan brought the House back into session (and the cameras were turned back on). GOP lawmakers — despite the sit-in and shouts of "shame, shame, shame" — held a vote on the Zika funding bill, passing it without debate. The Republican representatives, who control the House, then adjourned the body ahead of the scheduled holiday. "Just because they cut and run in the dark of night, just because they have left doesn't mean we are taking no for an answer," said Minority Leader Nancy Pelosi on Thursday morning, the AP reports. "Rep. John Lewis, a Democrat from Georgia, announced the sit-in earlier [Wednesday] morning.
" 'We have lost hundreds and thousands of innocent people to gun violence — tiny little children, babies, students and teachers, mothers and fathers, sisters and brothers, daughters and sons, friends and neighbors — and what has this body done?' Lewis said, flanked by fellow Democrats. 'Mr. Speaker, nothing. Not one thing.' "
Lewis is no stranger to sit-ins. He was a leader of the civil rights movement, chairing the Student Nonviolent Coordinating Committee, working as a Freedom Rider, marching to Selma and, of course, joining sit-ins in the South in the '60s. Ryan called the Democrats' sit-in a stunt and a gimmick. "It's not a gimmick for me," Lewis said, according to the AP. "Democrats sang 'We Shall Overcome.' ... Senators from across the chamber came over. Massachusetts Democrat Elizabeth Warren brought them Dunkin' Donuts. "In the galleries around the chamber, you had families of victims of gun violence, including a mother of one of the children that was killed in the Newtown shooting. Members held up posters of the names of people that had been killed in mass shootings on the floor. It was a very dramatic display." Crowds cheered from outside the Capitol, too. A total of 168 House Democrats, out of 188 total, joined at least part of the sit-in, the AP reports. A number of senators joined them on the floor. 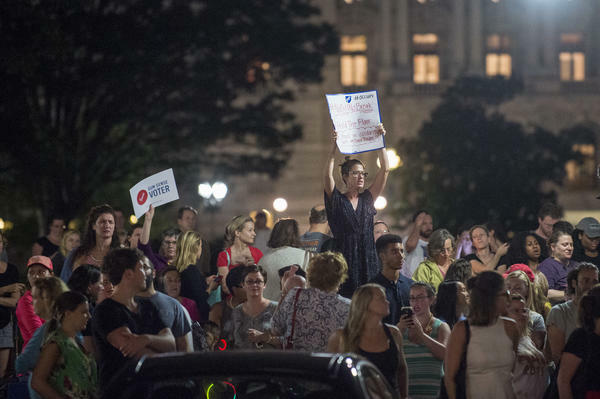 But after more than 20 hours of protest, the Democrats were "drained and dwindling," the news service writes, "some draped in blankets and toting pillows." It adds that some 16 lawmakers remained on the House floor as dawn broke Thursday. Earlier in the night, as Republicans left for the holiday, Rep. Maxine Waters of California said she was ready to stay "until hell freezes over," the AP reports. Despite a sit-in by House Democrats that has lasted 15 hours, Republicans passed a funding measure for Zika and left for the July 4 recess. The House will convene in a pro forma session Friday morning but no business will be conducted until July 5.